The scaphoid bone is one of the eight small bones of the wrist, called “carpal bones”. 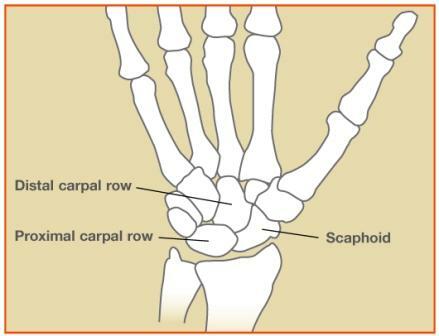 The scaphoid is critical for the normal functioning and range of motion of the wrist, as it serves as an important link between the two rows of carpal bones in the wrist. Of all the carpal bones, the scaphoid is the one most commonly fractured during an injury. A scaphoid fracture can occur from a variety of causes including sports injuries, falls, and motor vehicle collisions. However, the most common scenario is a fall on an outstretched arm in a young adult. It is common for people to overlook the injury at first. Once the pain and swelling from the injury improve, people may think the injury was a “just a sprain.” Often the diagnosis is delayed a few weeks or months. 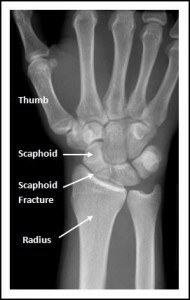 History, physical exam, and multiple x-rays are important for diagnosing a scaphoid fracture. Patients with scaphoid fractures are often tender to the touch at the base of the thumb within the “anatomic stuffbox” portion of the wrist. In many cases, the x-rays soon after the injury appear normal, and the diagnosis may be delayed. If patients are tender within the “snuffbox” physicians often treat them as though they have a scaphoid fracture, even if the initial x-rays are normal. After 2-3 weeks the fracture becomes clear on x-rays. Both CT scan and MRI can be helpful to evaluate various characteristics of the scaphoid fracture, and can be used to make an earlier diagnosis than x-rays. The treatment plan will depend on the severity of the fracture as noted on the x-rays and the patient’s medical condition, activity level, and desires. Patients who have well-aligned or “non-displaced” fractures may be treated without surgery. This usually requires a cast immobilizing the wrist for 2-3 months. Follow-up x-rays are obtained in clinic to evaluate how the fracture is healing. Therapy is often helpful in improving range of motion and strength after the fracture heals. Occasionally, patients with non-displaced fractures prefer surgery to reduce the amount of cast-time required. Some patients have fractures which are displaced, unstable, or at risk for not healing in a cast. Surgery may be advised for these patients. The goal of surgery is to stabilize the fracture with an implant and promote healing of the scaphoid. The surgery is performed on an outpatient basis often using regional anesthesia (nerve block) with sedation. During the surgery I improve the alignment of the fracture and use a metal implant to stabilize the fracture. Intra-operative x-ray called fluoroscopy is used to confirm the alignment. 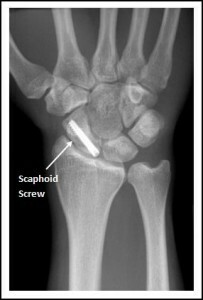 In most cases, I use a scaphoid compression screw to fix the bone. This is called “open reduction and internal fixation”. Occasionally bone graft is used to improve the fracture alignment and healing potential of the fracture. Bone graft can be taken from the nearby radius bone or the iliac crest bone of the pelvis. Your wrist and thumb will be protected in a splint which will be removed in clinic along with the skin sutures at about 10-14 days. At this point, a cast or splint will be placed to protect the fracture until healing is noted on x-rays or CT scan. I recommend avoiding heavy lifting, pulling, pushing or gripping for approximately 3-4 months after surgery. Pain, swelling, and stiffness in the wrist gradually improve over time. Most patients can return to more normal function at about 4-6 months post-operatively, but maximum improvement can take several months. Arthritis, also known as degenerative joint disease, may develop in the future if the initial injury damaged the joint surface. My goal is to help each patient obtain the most function possible after the injury. Adequate nutrition is important during the healing and recovery process. I recommend a diet rich in protein and calcium and an adequate intake of calories per day while your body is healing. Please do not smoke. Not only is tobacco damaging to cardiovascular and pulmonary tissues, it inhibits soft tissue and bone healing, particularly scaphoid bones. If you smoke, the risk of nonunion, delayed healing, and infection are higher. Possible complications include bleeding, infection, stiffness, nonunion, avascular necrosis (AVN), arthritis, implant failure, and damage to the surrounding nerves and blood vessels. A fracture which fails to heal or unite is known as a nonunion. Other complications are also possible but are uncommon.